Yep, got the 70-200 F4L. Thanks to phuvanio for bringing me to redflagdeals, I didn't get the one you linked, but from another buyer, I got a amazing deal it,and still have the warranty for a year. Haven't used it to much, but once I get some good photos, Ill post some... Planning ahead, sooner or later I'm going to get the Extender, not sure which one yet. Last edited by mill$civic; 30-Jun-2008 at 10:03 PM. Nice purchase, man. How much? great purchase...cant go wrong ever with that L glass. thats a keeper and this is my next lens for sure. Steve's soooooo jealous! So far he's outnumbered in this post 4 to 1. Lol. Congrats, hope I steered you in the right direction. Hope you have more money in your pockets, because you are not going to want to shoot with anything else besides "L" lenses now. I just clicked on your photo, THAT THING IS HUGE! LOL Awesome man! Put all those Nikon wimps to shame! Lets see some test shots! Test shots up soon, I have tomorrow off and its supposed to be sunny! Time to welcome in the new family member lol. Yeah, where the hell are those photos? 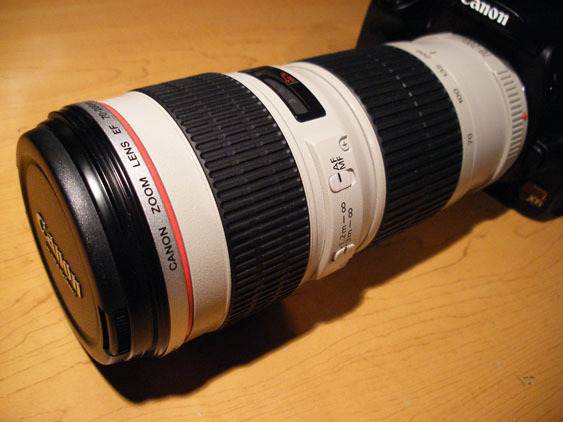 it's a canon lens, what did you expect?? he clicked the shutter just after he posted and that pos is so slow it's still sending light to the sensor!! !